People have been enjoying the rich and wonderful taste of butter for more than 6,000 years. Archaeologists have found pounds of ancient butter buried in the peat bogs of Ireland. 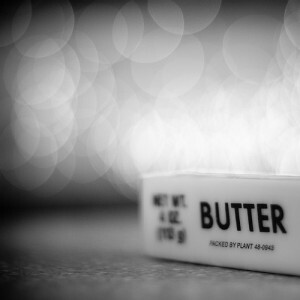 Butter is still made in essentially the same way as it has been for thousands of years. Roll up your sleeves and make butter like the ancients! 1. Fill your baby food jar about ½ full with whipping cream. 2. Add a pinch of salt for taste. 3. Seal the cap on tight. 4. Shake your jar up and down vigorously. 5. You will notice that soon you will have a creamy substance that we know as whipped cream. You’re not done yet! Keep shaking! 6. Soon you will have a clump surrounded by a liquid. The clump is your butter and the liquid is buttermilk. 7. Drink the buttermilk if you like, it’s full of protein. 8. Place your butter in a piece of cheesecloth and squeeze the excess liquid out. 9. Use your butter knife to spread your creation on crackers and enjoy! When milk straight from the cow is left to stand it separates into skim milk and cream. The cream rises to the top. The cream is full of proteins and fat. When you shake the cream and agitate the fat globules, they stick together to form butter. The leftover liquid is called buttermilk and it is full of protein. Interested in learning more about cooking and the science behind it? BEYONDbones will be bringing you The Science of Food – a series of videos exploring the science involved in the culinary creations of some of the best chefs in town. Its all part of Big Bite Nite on April 30, an event featuring food from over 30 restaurants all in one location – HMNS. thanks…i like to know the why and how behind things.